The lifespan for both men and women steadily increased over the past century, reaching an average for both sexes of just under 79 years in 2010. However, despite the good news of a longer life, this simple average fails to paint an accurate picture of the overall health of the American population. One alarming health statistic is that 50 percent of all adults have at least one long-term, chronic health condition. The ratio rises to 80 percent when considering adults over age 65. A chronic disease is a health condition that has no concrete cure but the symptoms of which can be suppressed or controlled with medication or lifestyle changes. Some of the most common chronic diseases in America include heart disease, diabetes, Alzheimer’s disease, osteoporosis, sickle-cell disease, arthritis and cancer. There are many causes of chronic disease. Some, such as osteoporosis, sickle-cell disease and cancer, include a genetic component that predisposes individuals to the disease. However, a vast majority of chronic health conditions are caused or contributed to by lifestyle choices. Obesity, a condition which is a choice for almost everyone who suffers from it and which is now considered a chronic health condition itself, is the most common lifestyle risk factor, followed by smoking, failure to exercise and overuse of alcohol. Many of the most common chronic health conditions, including diabetes, heart disease and arthritis are closely linked to obesity and lack of exercise, while smoking contributes to many kinds of cancers, as well as chronic obstructive pulmonary disorder and emphysema. 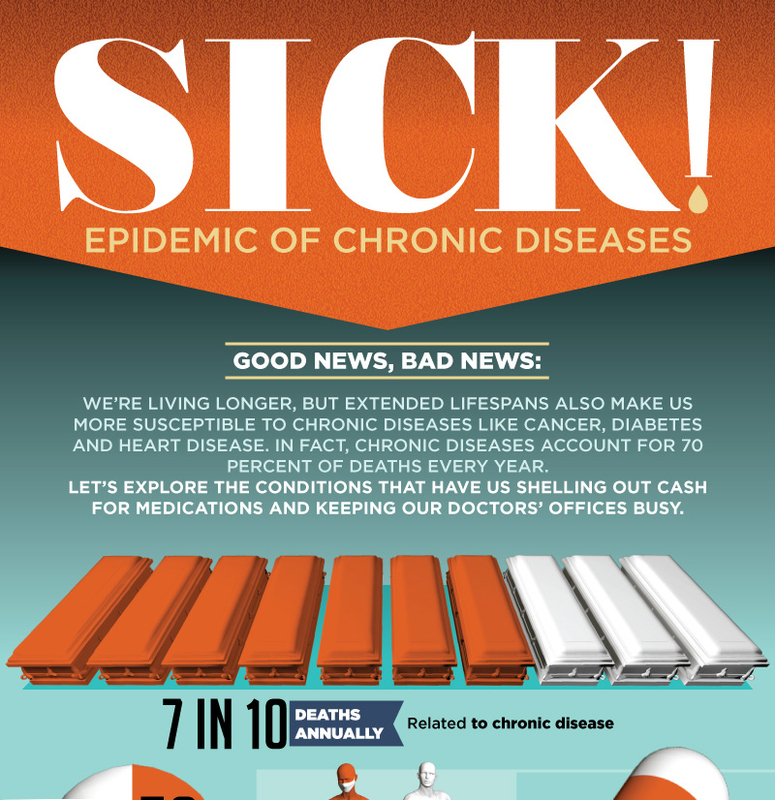 In some cases, chronic diseases also lead to further health problems. For example, diabetes, a condition diagnosed in nearly 20 million Americans, with potentially millions of additional undiagnosed cases, has been linked to increased risk of strokes and kidney failure. The outlook is positive for many people with chronic health conditions. Cancer survival rates are increasing and new research is leading to the development of improved treatments to prolong the life of chronic disease sufferers. More Americans are also getting the word on ways to prevent long-term health conditions before they develop. Although cures for many chronic diseases may never be found, developing an understanding of why chronic diseases occur and how to better control their effects is a step in the right direction. Really??? California Man Diagnosed With "Chronic Homosexual Disease" After Being Examined By New Doctor! Why Do Americans Die Younger Than Citizens of Most Other Rich Countries?